If you asked most people you know what comes to mind when they think boat shoes, put your money on Sperry boat shoes brand being the first thing out of their mouths. While the most iconic brand out there, a little known fact is that they actually invented them. In 1935 Paul Sperry, a sailor, set out to design a new kind of shoe–one without a leather sole–that would prevent sailors from slipping and sliding on the deck with every wave. Modeled after the grooves in the paw of dogs that inspired his traction design, the Sperry sole was born. And the rest, as they say, is history. These days boat, or deck shoes, are much more prevalent, and are as much a fashion staple as they are a tool for boaters. With their classic casual styling, you see them on men just about everywhere, as they’re favorites for the home, office, and going out. They’re even popular with the younger set, and they now come in a range of styles, materials, and colors. Sperry is still king of the castle when it comes to this line, and there are many styles and colors to choose from. Here are some of the classics as well as updates, some modern fan favorites, and a guide to navigating the Sperry waters when it comes to your particular needs and preferences. The details include hand-sewn top sole around the toe for comfort and fit, and a kicker at the heel to help hold its shape. The 360-degree lacing helps secure your foot, as you can tighten or loosen it to your comfort level. The upper is a single solid piece for a more comfortable fit over the top of your foot. The iconic wave grooves of the sole provide slip resistance and grip, as they channel the water out from under your feet. The rubber outsole is sewn on, which proves for a more long-lasting and durable lifespan. There’s a slightly raised heel, specially designed to navigate the obstacles and natural contours of the deck of a boat. The EVA heel cup provides comfort, cushion, and shock absorption. This is highly recommended for the avid boater and someone who likes the fashion side of it. It’s a timeless, classy look that will never go out of style. You can choose from 10 different colors, and single or dual tones. If you’re more of a serious boater, out in wetter and rougher conditions, this is more in line with your needs. The sole contains mini lugs with the traditional Sperry siping, which increases the level of traction delivered. The rubber outsole is cupped in shape, also adding protection against the elements and heavy weather. The upper leather is coated in rubber and water-resistant. You get the standard 360-degree lacing for a secure, personalized fit, and the molded EVA heel cup and “Ortholite” footbed cushion for absorbing shock and provided excellent cushioning and comfort. The outsole is designed with enhanced grip and is of course non-marking. If your needs are a bit more serious in terms of weather, this is a good choice. For the more discerning boater or fashion-forward shopper, this is the Original Two Eye, fancied up a notch. If you prefer a little more luxury, have a look-see. Do you like a super soft lining? Then these are squarely in your wheelhouse. It’s constructed from lambskin. The uppers are made from high quality, supple leather, and the eyelets are 18-carat gold-plated. You can still take these out in the bay, and the siping will channel the water between you and deck to prevent slipping, and you can tighten them to fit your foot precisely. Same great construction in this one, just taken up a notch in terms of style. As the name implies, this is actually the original. The first one, invented by Sperry himself in 1935. If you’re a classicist, you can stop reading right now and get ye to the shoe store (or, well, let’s face it, sperry dot com). True to his legacy, they’re made of genuine leather, have the 360-degree lacing, the OrthoLite footbed and the molded EVA heel cup for cushion, support, and shock absorption. You’ll find waved contours in the soles for traction on both dry and wet surfaces, and of course a non-marking rubber outsole. If the traditional shoe is too heavy for your feet, check out the Gamefish. It’s 37% lighter than its leather brethren, as the uppers are made of knit, which also provide breathability and more stretch-to-fit level of comfort. The EVA footbed is removable and designed to compress with the movements of every step and absorb shock so your joints don’t have to. The classic siping draws water out of your path for traction, and the midsole is built from EVA foam, providing heel-to-toe compression padding. You still get the 360-degree lacing style and customizability in this updated, modern option. Another choice if you want to go first class on style and comfort, the Chevre has linings made from lambskin for a slipper-like level of comfort and softness. These have hand-sewn full-grain leather uppers and suede collars. You also get the 18-carat gold-plates eyelets on the lacing, for a prominent look. The rawhide laces are extremely rugged and durable. Same non-marking, ultra-grip delivering rubber outsoles and wave siping for traction in all types of weather. This is classic Sperry for the discerning. This is the perfect marriage of form and function, serving you from the cafe or walk home from work, to the weekend on your boat (or better yet, your friend’s boat!). All the classics are here: 360-lacing and a hand-sewn upper, only on this one it’s made of camouflage canvas instead of leather for a more rugged and casual look. Designed by Jack Spade himself, this edgy, urban design will turn heads. And you won’t sacrifice comfort or support because you get the Ortholite heel cup absorbing the shock of walking around town, and the wave siping will keep you upright on deck. 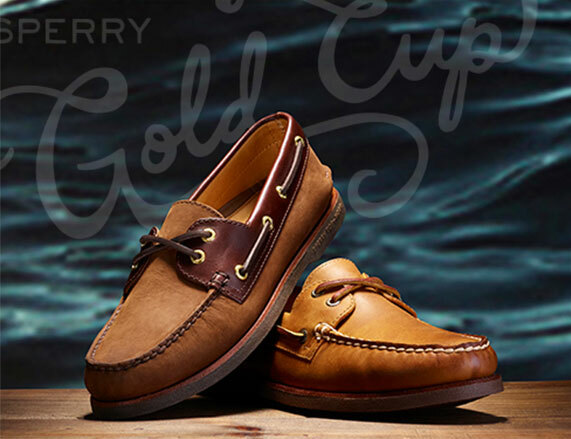 Whether you’re looking for high class fashion, extreme protection from wind, rain, and weather, or tradition that will last for decades, there’s a Sperry boat shoes for men that’s perfect for you. Top Serry’s competitor is Sebago. Sperry women’s boat shoes reviews will be posted on our blog soon. With its rich history, fiercely loyal base, and quality that speaks for itself, this icon has earned its reputation.